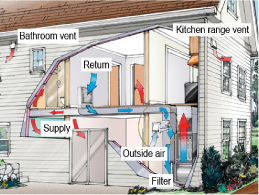 This is a complete pressure test of your home which includes a blower test performed in conjunction with a duct system test. Combining the two tests will allow us to determine the amount of air leakage to the outdoors as well as air leakage within the house. A complete report is provided which will document any issues with these systems and provide recommendations for improvement.